Bathrooms have changed over the past 10 years and homeowners are becoming a little more adventurous with design and material choices. I have put together 5 of my favourite design elements that you can easily incorporate into your new bathroom. I am noticing trends from Europe where vanities look more like pieces of furniture, they are quite detailed and add lots of character to the space. Look for a vanity that has great storage and is easy to clean. There are so many beautiful mosaic tiles on the market at the moment, they can act as an accent wall to the bathroom by using them on the vanity or shower wall for full impact. A non-committal way of introducing colour to your bathroom is by painting the walls in an accent colour. 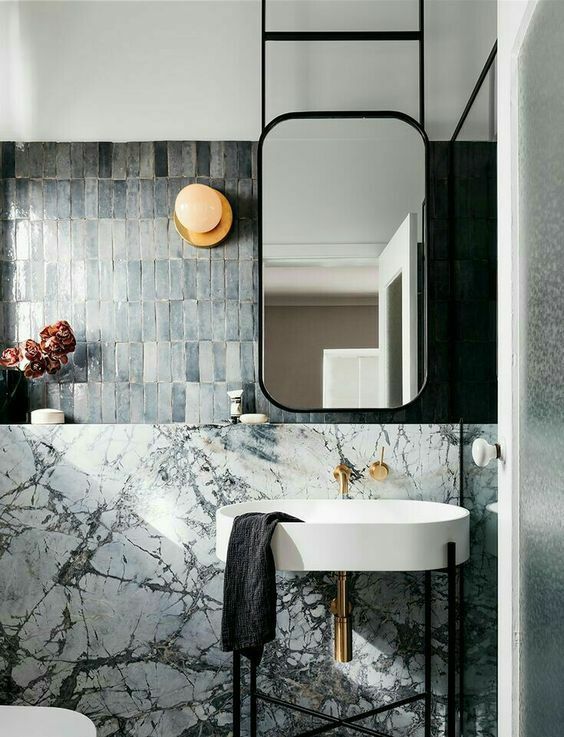 This is also a great way to save money on tiles as you can just use tiles around the mandatory areas such as around the shower, bath and vanity and paint the remainder of the walls in a bold colour. At the end of the day, it's just paint and can easily be painted over if you get tired of that colour! If a minimal colour and material palette is more your style, its all about less is more. Introducing large format stone slabs is a great way to achieve that look. There is no grout lines and gives a sense of luxury. If natural stone is out of the budget, consider using porcelain slabs. They look very realistic, practically maintenance free and not as expensive as real marble. To create an amazing bathroom experience, I believe it all comes down to the type of shower head you select. There are so many shower systems out at the moment, it all depends on how you and your family live. Think about flexibility, you might need a hand held shower to easily clean the tiled walls and shower screen but prefer a large rain head to wash your hair. There are multiple options you can use so you dont have to just stick to one! If you are planning on renovating your bathroom and still feel overwhelmed on where to start or what floor plan and materials might look best, I'd love to organise a chat over the phone to give you some ideas on where to start and how we can best work together to make your project as stress free and seamless as possible. Click on the button below to book in a time.